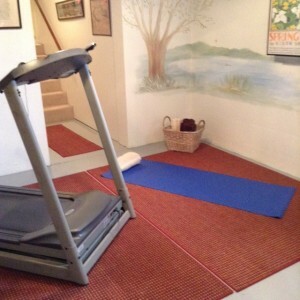 Tempted to let your fitness routine lapse while enjoying your B&B getaway? Innkeepers like Marilyn at Riverview B&B in Neshkoro make it easy to treat yourself to a workout - in a room with a view of history. 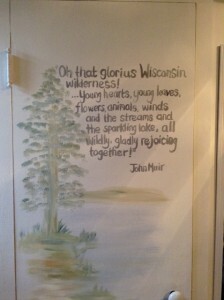 Inspired by a presentation on John Muir's history in Marquette County and the talents of a local muralist, the Muir Room exercise area was created. Practice yoga, walk/jog on the treadmill - TV viewing optional. The wall murals not only reflect local history, but are similar to the views of the White River that guests will enjoy at Riverview B&B. And, if you need a bit more motivation to 'get moving', Marilyn's yummy Blueberry French Toast Bake will do it!